The Sales Tracking Calendar App is now FREE! 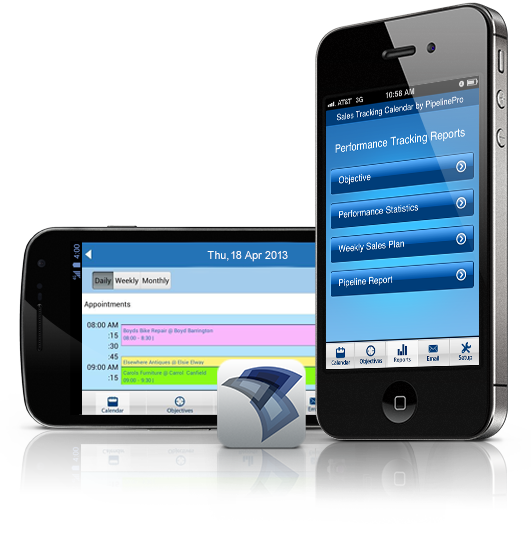 Sales Tracking Calendar App is a daily & weekly calendar for sales reps. It tracks sales activity & automatically calculates a salesperson's performance & closing ratio reports, pipeline report, remaining objective & sales plan. Best app for any sales rep - from new hire sales people to seasoned professional inside & outside sales reps! The Sales Tracking Calendar App is the only daily or weekly appointment book style app that not only manages your sales appointments, follow ups, referrals and meetings but also tracks the RESULTS of those sales presentations! PipelinePro's Sales Tracking Calendar App easily tracks Sales, Cold Calls, Sales Objectives or Goals, Average Sale Amount, Pipeline Report, Sales Plan and Closing Ratios! Every client, customer or business lead that you have had a meeting with will be stored inside the app's Contacts feature. It also stores important information in the Notes section for each of your customers to save for future meetings and sales opportunities. PipelinePro's Android and iPhone App keeps track of which clients you have had appointments with but haven’t closed a sale with just yet, and keeps a 100% current Pipeline Report of your currently working sales leads, which can be quickly emailed to you and/or your sales manager with a single click. By recording and tracking important sales performance numbers, activity and closing ratios PipelinePro's App automatically calculates and creates a Weekly Sales Plan to follow to help hit your sales objectives and goals, and meet your deadlines! You'll know exactly how many Cold Calls you must make, how many Appointments you must Set and how many Sales you must Close each week in order to achieve your sales goals. I am VERY impressed with the support from the app so far. Not often do developers respond to requests let alone reach out by themselves to try and help the user. By far the easiest and most thought out sales tool for professionals in the app store, I tried out 3 or 4 this is the best.